Planning a week of workouts means assigning a specific day to certain muscle groups. It's somewhat unusual to plan arms and shoulders together. You might do a shoulder and triceps day, but adding pull-movements with your biceps is a departure from the norm. That's not to say you can't train arms and shoulders together, just be diligent when planning the rest of your lifting week to leave at least 48 hours of rest between muscle groups worked. Do two to three exercises for the biceps and triceps, and three to five for the shoulders, to hit the muscles from all angles. 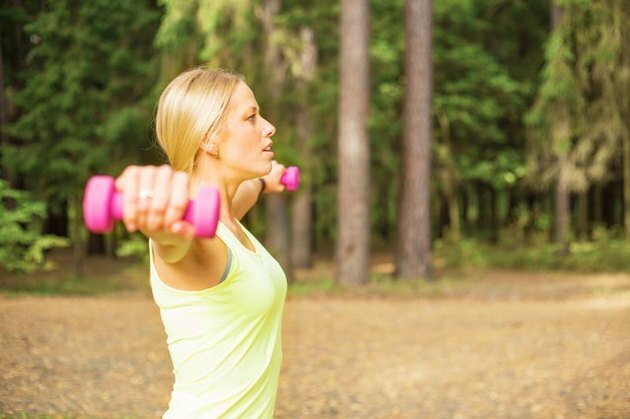 Aim for three sets of eight to 12 reps of each move, leaving about 45 seconds between sets. Work your shoulders first, then move on to biceps and finish with triceps. You can also design your own workout using the exercises below. Concentration Curls: Sit on the edge of a workout bench with your legs slightly wider than your hips and your feet firmly grounded. 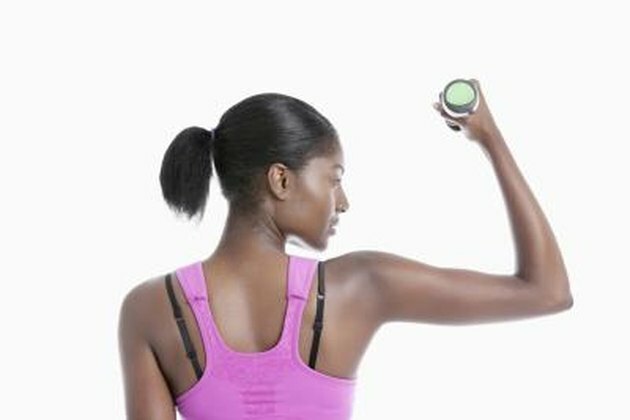 Hold a dumbbell in one hand and lean forward to support the back of your upper arm against your inner thigh. Bend your elbow to curl the weight toward your shoulder and release. Chin-Ups: Hang from an elevated bar with an underhand, slightly-closer-than-shoulder-width grip. Allow your legs to hang or have a spotter hold your legs for an easier modification. Use your arms to pull your chin up over the bar and release down. Cable Curls: Stand in front of a pulley column fixed with a straight bar attachment. Set the pulley to the lowest level. Grasp the bar with an underhand grip and bend your elbows to curl the weight up and down. Incline Curls: Sit back on a workout bench set at an incline of 45 to 60 degrees. With a dumbbell in each hand, allow your arms to hang loosely along your sides. Curl the weight up to your shoulders and back down. Turn the palm so it faces forward as you curl. Triangle Push-Ups: Get into a traditional push-up position, but bring your hands together under your chest to form a triangle shape. Bend your elbows to push up and down. Overhead Extensions: Stand and hold a dumbbell head with both hands and extend your arms over head. Bend your elbows to lower the weight behind your head; keep your elbows pointed to the ceiling throughout. 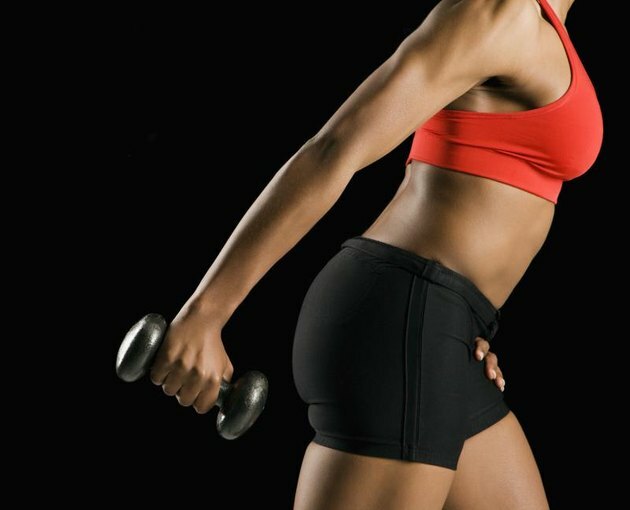 Kickbacks: Hold a dumbbell in each hand with your arms hanging alongside your thighs. Hinge forward slightly from your hips and pull your upper arms back so they are parallel to your ribs. Bend and extend your elbows, keeping your upper arms fixed. Dips: Sit on the edge of a workout bench or elevated step riser. Place your hands on the surface under your shoulders, fingers facing your feet. Lift your buttocks so your weight is supported by your hands. Bend and extend your elbows to lower your torso and hips down and up. Keep your knees bent, or extend the legs for a tougher version. The primary shoulder muscle, the deltoids, has three angles — all of which need working for your training to be comprehensive. Include at least one exercise for each muscle section. Front Raise: Stand with your feet hip-distance apart and a dumbbell in each hand, arms hanging in front of your thighs. Keep your arms straight as you raise them up in front of you; pause when you reach chin height, and then lower back down to start. Shoulder Press: Sit or stand and hold a dumbbell in each hand at your shoulders, elbows bent out and slightly down. Press the weight up overhead and back to the start. Pike Push-Ups: Get into a Downward-Facing Dog position from yoga with your hands and feet on the floor and your hips hiked toward the ceiling. Bend your elbows to execute a push-up — keeping your hips high — to drive more resistance to the fronts of your shoulders. Reverse Flyes: Lie with your chest and stomach against a workout bench inclined at 45 degrees. Hold a dumbbell in each hand and allow the arms to hang straight down. Open your arms, keeping them mostly straight but not locked at the elbow, as if you were getting ready to give a big hug. Arc them back together to complete one rep. Variation: Bend the elbows widely as you pull the shoulder blades together for an incline wide row. Reverse Pec Deck: Set the handles of a pec deck machine close to the anchoring pillar. Sit on the seat with the handles positioned at chest height. Grab a handle with each hand and pull the shoulder blades together to open and close the arms. Lat Raises: Stand, holding a dumbbell in each hand and arms hanging along the sides of your thighs. Raise your arms together to the height of your shoulders; pause and release for one rep.
Upright Rows: From a standing position, hold a barbell with a shoulder-width overhand grip. Allow the bar to hang freely in front of your thighs. Bend your elbows to pull the bar up to the height of your chin; keep your elbows higher than your forearms the entire time. Lower to the start. If you have shoulders and arms planned for Monday, give your upper body a rest on Tuesday and do legs. Wednesday could focus on back and abs and Thursday is when you train chest. Take a day off and begin the cycle again on Saturday with arms and shoulders. This ensures you give each muscle group adequate rest between workouts so they have time to repair and grow in size and/or strength.